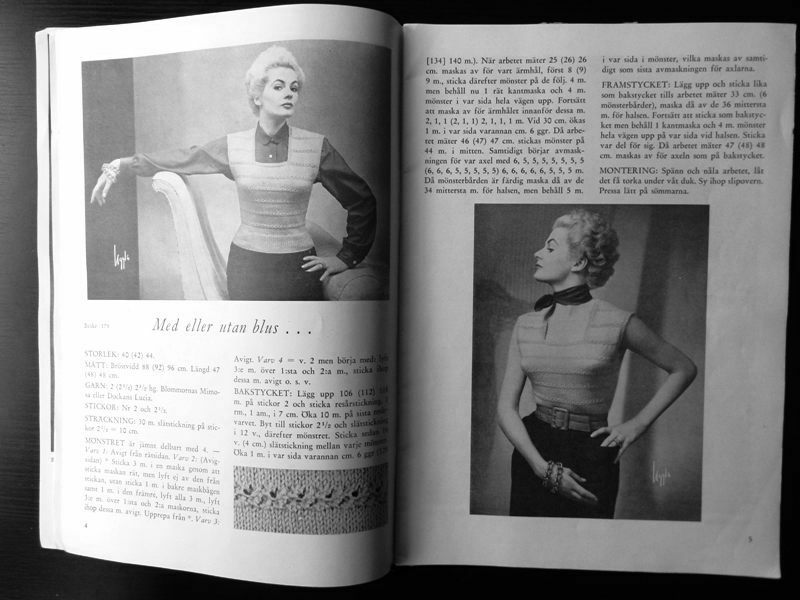 While I go thrifting a lot, I rarely come across sewing or knitting patterns predating 1960. 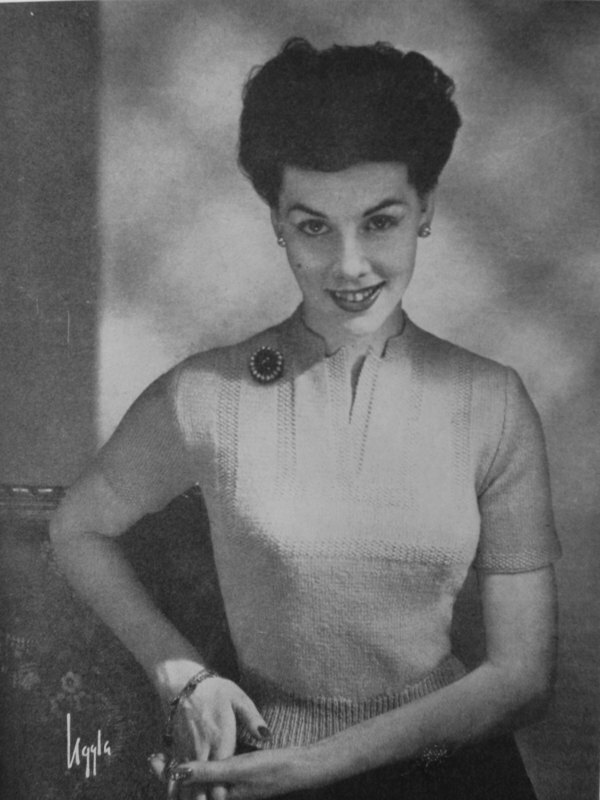 Earlier this year, however, I happened to stumble upon a small stack of knitting magazines from the 50s and early 60s and as they were very cheap, most came home with me. 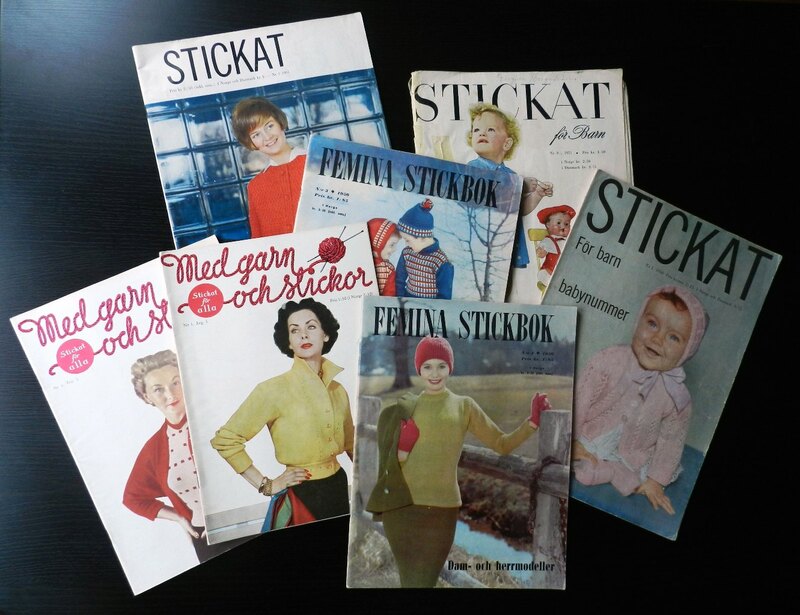 Judging by what is on offer on Tradera (Swedish e-Bay), Stickat (Knitwear) and Femina Stickbok (knitting book of Femina magazine) were the two biggest knitting magazines, while Med garn och stickor (With yarn and knitting needles) appears to have been less common. 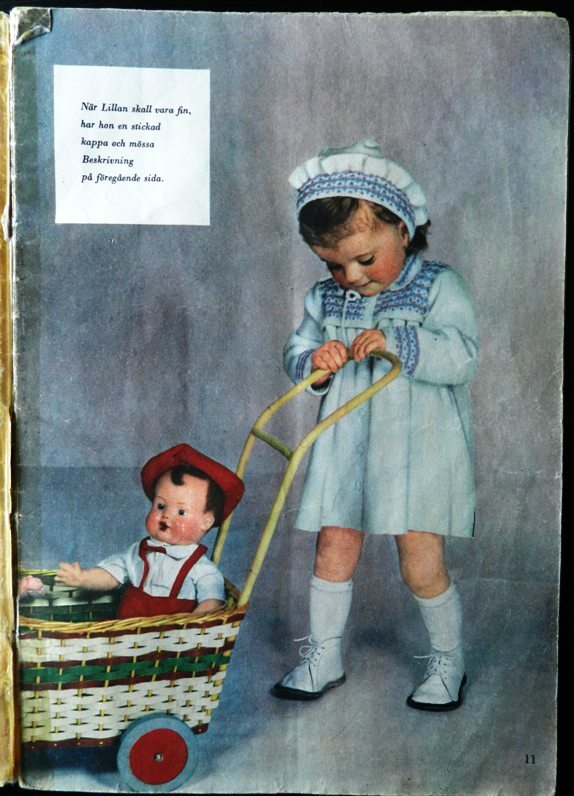 Of the four magazines containing children’s patterns, two are focussed on babies up to two years old, so I doubt that I will knit anything from those any time soon. 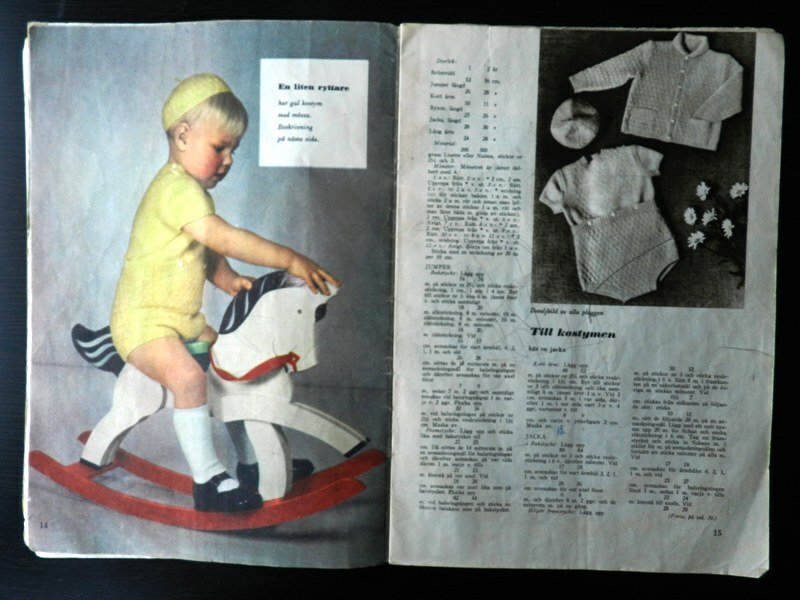 I do like the photos, though, especially the ones of kids posing with their toys. 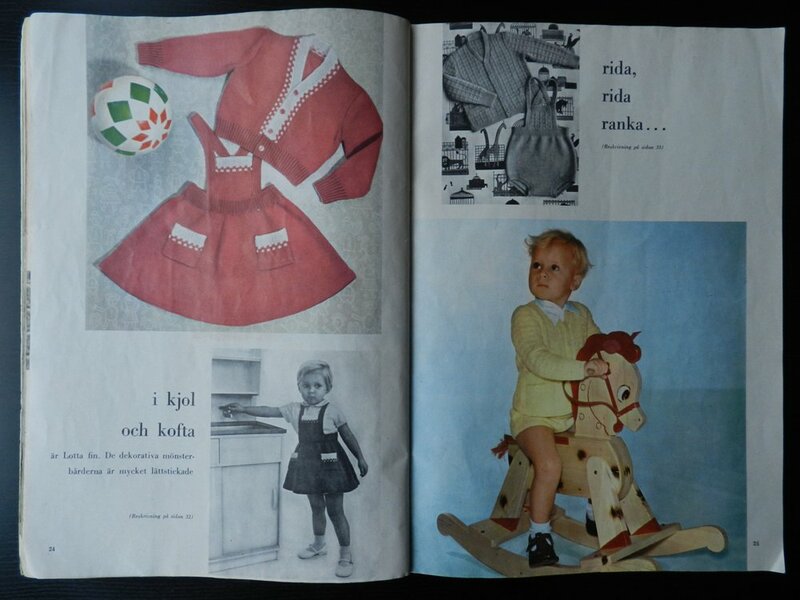 Next up are the two issues of Med garn och stickor, both from 1952. 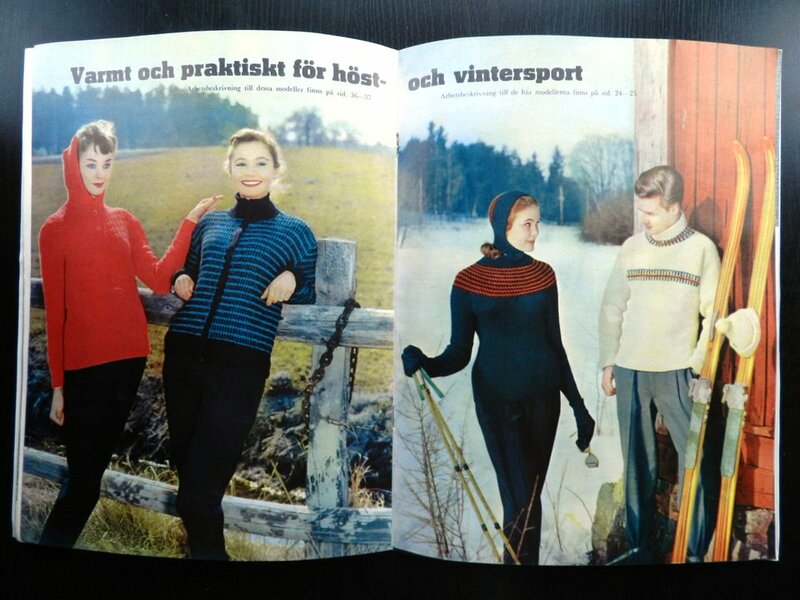 They contain many lovely jumpers with interesting necklines that I would wear in a heartbeat. 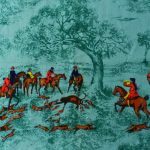 While most are probably more suitable for warmer weather, the first can also be worn over a blouse. 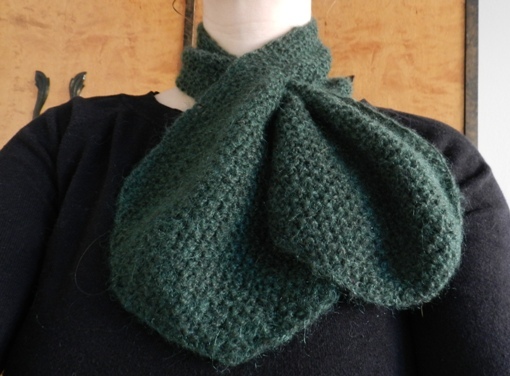 This one does not seem too complicated either (I am still a basic knitter) and would be a welcome addition to my wardrobe. 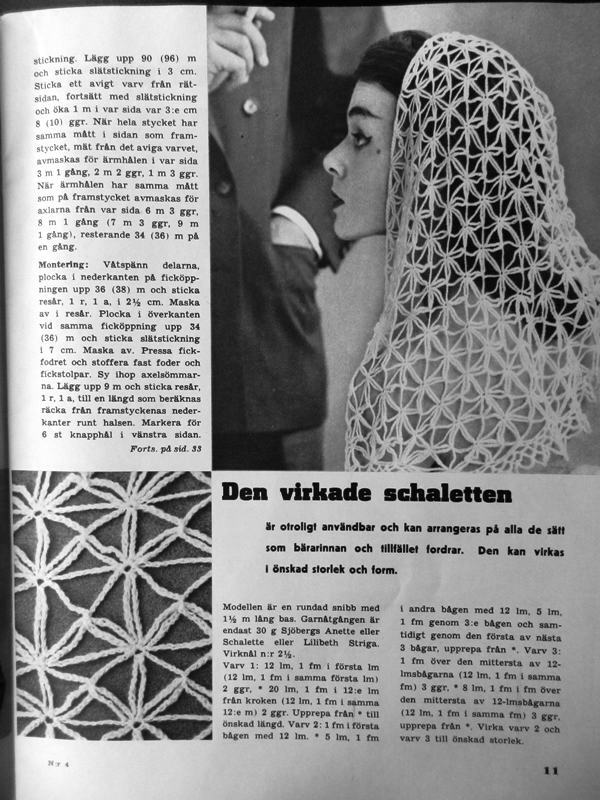 Click on the image to enlarge and read the pattern (in Swedish!). 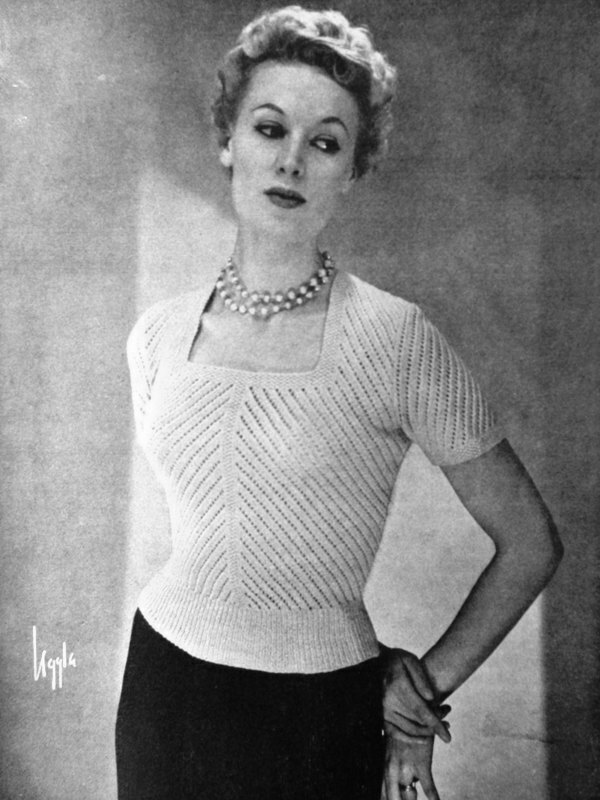 I am a sucker for necklines with triangular cut outs, so this sweater is right up my alley. 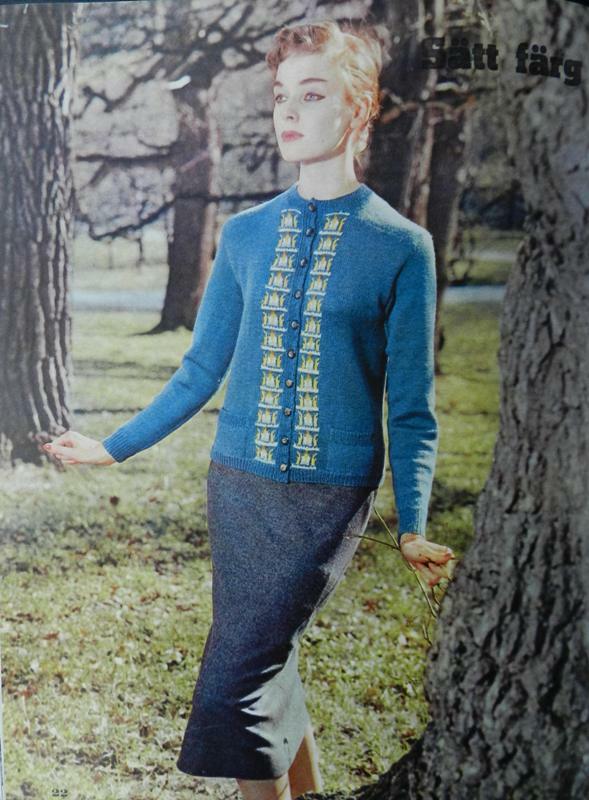 This double-breasted cardigan looks very wearable. 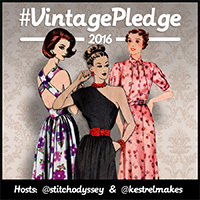 I actually bought a similar new (but thrifted) one with 3/4 sleeves not too long ago. 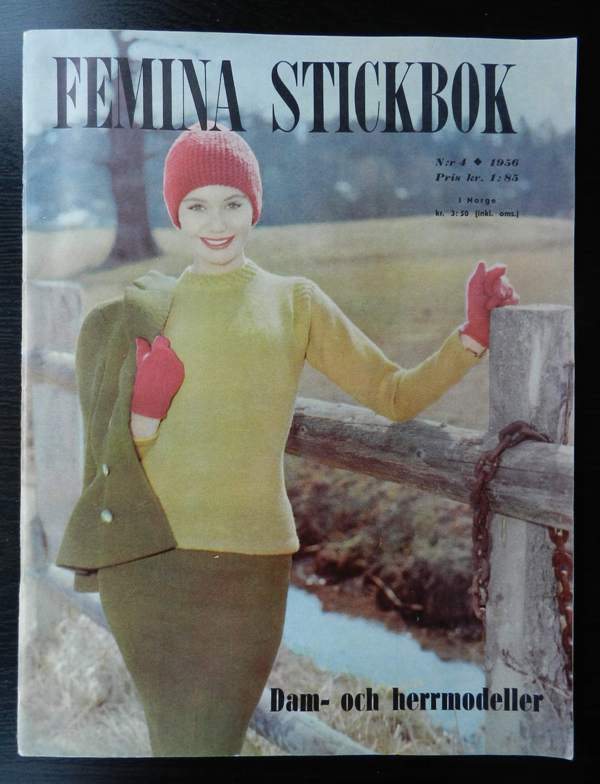 The last few images are from Femina Stickbok from 1956. 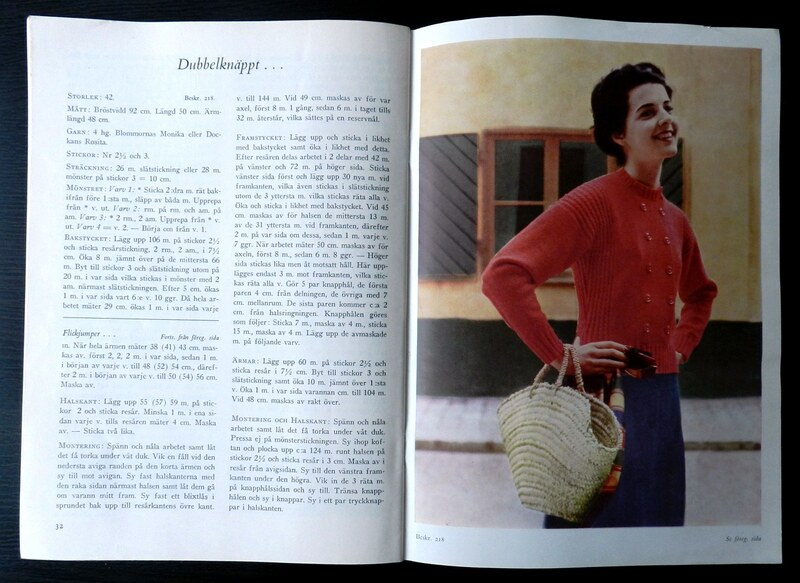 While I prefer knitwear from the 40s and early 50s, I like the colour photographs in this issue and the combination of practical and more glamorous and complicated garments. Love this casual, yet stylish look. The eye make up is pretty cool too! 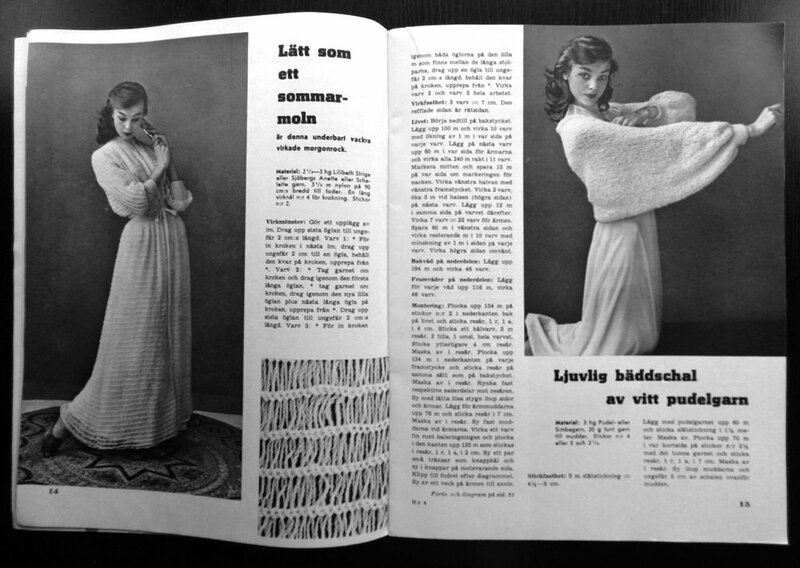 This knitted dressing gown, “light as a summer cloud”, seems rather impractical, but how cool would it be to float around the house in this thing. The colour photographs make everything look so much fresher and more modern, I think. Yes, this is a knitted suit. 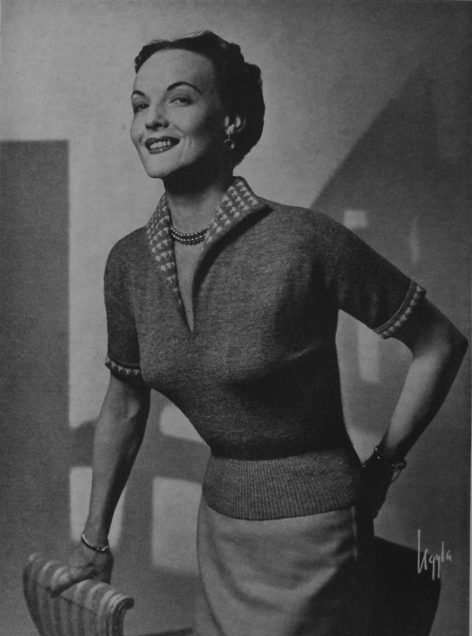 The jacket and skirt are knit from side to side, alternating between two colours. So much patience! 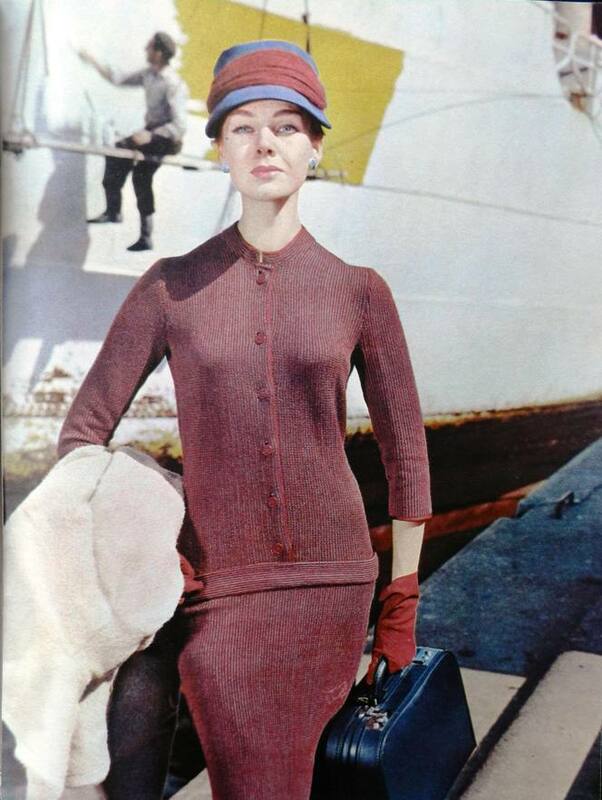 I think that this is a pretty photograph, but the model’s barbie arms are somewhat disturbing. 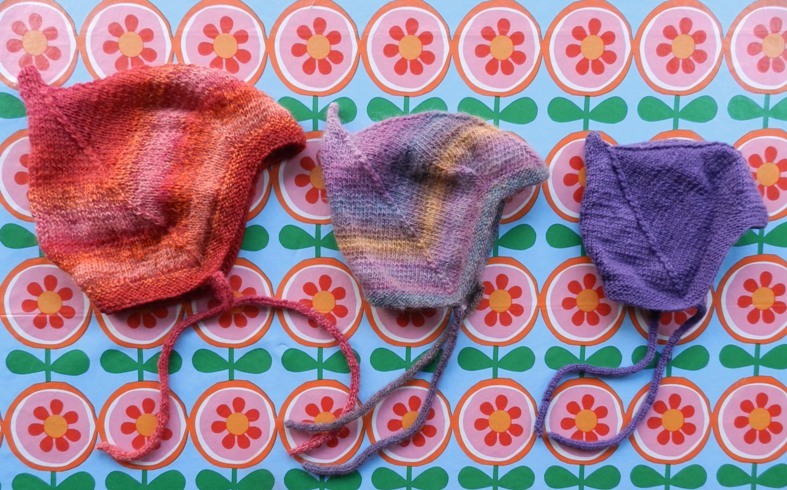 I would really like to try out one of the short-sleeved jumpers, but I am not sure if I have any yarn in my stash that would work for these. 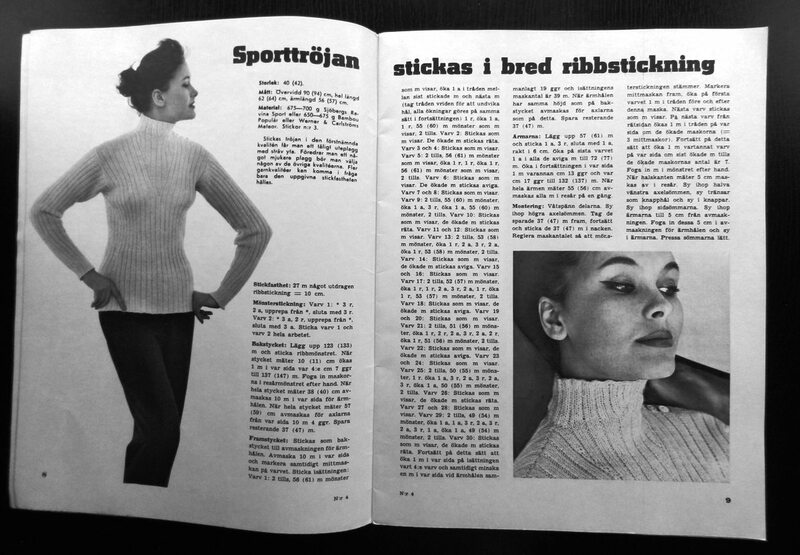 At the moment, I am knitting the Small Jacket from Vintage Knitwear for Modern Knitters, which is a quite a fast project, although I am afraid I might run out of yarn soon. 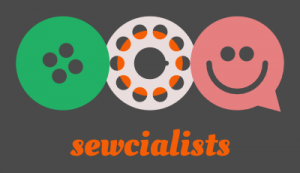 After that it is my daughter’s turn to receive a new sweater or cardigan, so I doubt that I will get around to any of these patterns before next year.